All Chamber members are welcome to attend. During this time we catch up on the latest happenings in our area and manage the business of the Chamber. All Chamber members are encouraged to attend. Promote your business at a networking event that gives attendees the chance to exchange business cards, develop new prospects and share a 60 second "commercial" with all attendees Bring plenty of business cards – you’ll need them. Let us help you celebrate! Are you opening a new business, expanding at your current location, relocating, or celebrating a milestone anniversary? 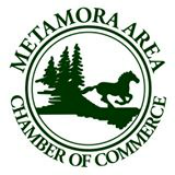 Let the Metamora Area Chamber of Commerce help you celebrate! A Ribbon Cutting ceremony is an important part of your overall marketing and advertising plan and is a great way to kick off a grand opening or relocation of a business. Contact the Chamber to arrange for a Ribbon Cutting.